Welcome to my blog! I'm so happy you're here. I want to start with a topic that's near and dear to my heart: fibromyalgia. Diagnosed in my 20s, this is a complex chronic pain syndrome that has deeply affected my life, along with an estimated 5 million Americans (75-90% are women). Symptoms include fatigue, widespread muscle/soft tissue pain, stiffness, sleep disturbance, chemical and environmental sensitivities, migraine, and memory and concentration issues (aka fibro fog). There are also overlapping conditions that some fibro sufferers experience, such as lupus, rheumatoid arthritis, anxiety and depression, TMJ disorder, and irritable bowel syndrome (IBS). Although there is not yet a cure for fibromyalgia, and this can feel hopeless, there are treatments and lifestyle modifications that can be made to ease symptoms. The severity of symptoms can wax and wane, as well, sometimes flaring or going into remission for a period of time. 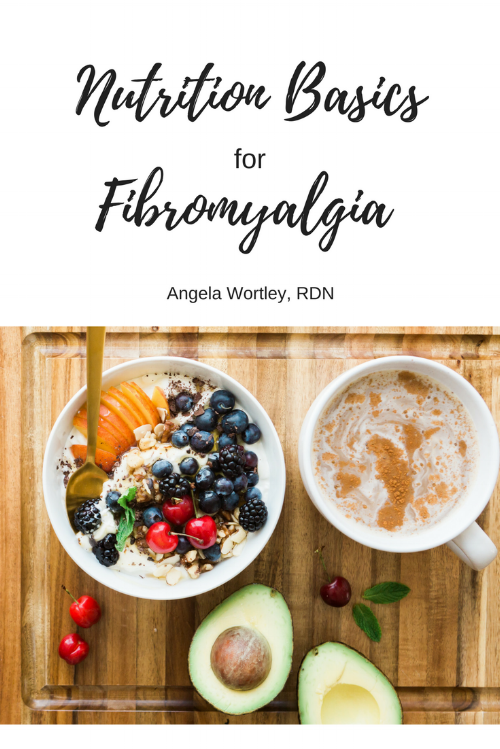 There is no one diet that works for all people with fibromyalgia, but there are a number of things that can help address symptoms and support overall health. When you already feel like you've been trampled by a herd of elephants, the last thing you want is to feel even worse because of what you eat. Studies have shown a correlation with chronic pain and low vitamin D. One small randomized controlled study showed promise of pain reduction in women with fibro who supplemented with vitamin D. Other studies have shown that low vitamin D is associated with anxiety and depression in people with fibro. Have your levels checked (25-hydroxy vitamin D blood test) by your doctor to determine if supplementation is appropriate for you. Magnesium, selenium, and other antioxidants were found to be low in people with fibromyalgia. Whether this contributes to the symptoms of fibro or is a result of the disorder is unclear. Improving antioxidant status through including plenty of colorful fruits, vegetables, and legumes (beans, peas, lentils) is typically more beneficial than supplementing because you're getting all the nutrients of the whole food and studies on antioxidant supplements have not shown to be helpful in disease prevention (and supplementation is sometimes harmful). Foods high in magnesium include beans, sunflower, pumpkin, sesame, and chia seeds, dark leafy greens like kale, and whole grains. The RDA for magnesium is 320mg for women and 420mg for men. Selenium is found in high amounts in Brazil nuts. Just one large Brazil nut can contain over 2x the RDA for selenium, if grown is selenium-rich soil. Beans, whole grains, nuts, and seeds are also good sources. The adult RDA is 55 micrograms per day. The first line of defense to prevent nutrient deficiencies is to make sure we're getting the vitamins and minerals we need from our food when possible. Some nutrients, like vitamin D, can be difficult to get from food only. In general, I only consider supplementing if someone is already eating a nutrient-dense diet but has a deficiency confirmed by a blood test. Decreasing refined, processed foods that are typically low in micronutrients and high in sodium and/or sugar (such as white bread, pastries, and frozen meals) is the best place to start. Simple, homemade meals with fresh ingredients as often as you can will provide your body with the nutrients it needs. A good rule of thumb to is to make half your plate non-starchy vegetables of all colors, including dark leafy greens that contain magnesium, vitamin k, calcium, and iron. To make things easy, I keep frozen kale, spinach, and broccoli on hand so I can add them to whatever I'm cooking. Eating regularly and not skipping meals is important for stabilizing blood sugar and energy levels. If you're going more than 4-5 hours between meals, try to have a snack that includes complex carbohydrates, a healthy fat, and protein, such as an apple with peanut butter (or small handful of almonds), or whole grain crackers with hummus and veggies. Along with environmental sensitivities, some people with fibromyalgia have food or food additive (such as MSG or aspartame) sensitivities, especially if IBS or migraines are an issue. It's important to note that food sensitivities differ from food allergies. Registered Dietitian Erica Julson has a great post here about the differences between an allergy, intolerance, and sensitivity to food. Keeping a food and symptom journal for at least a couple of weeks may help you notice patterns. If you suspect food sensitivities, it's best to get the support of an experienced health practitioner (physician or dietitian) before trying an elimination diet. The goal of an elimination diet is to determine the culprit(s) that may be causing digestive upset or other symptoms and to then include the widest variety of foods that do not cause symptoms. Elimination diets can sometimes trigger disordered eating behaviors in some people, so if you have a history of an eating disorder, please get the advice of a healthcare professional before attempting one. It's also important to note that digestive symptoms can also be caused by stress, so sometimes it may seem like food is the issue when it's not. People with fibromyalgia are prone to digestive issues due to our hyperactive nervous systems. If digestive disturbances (bloat, nausea, constipation, diarrhea) are affecting your quality of life, a consult with a gastroenterologist (GI doctor) is best before making any diet or supplement changes on your own. There are a few studies that show switching to a vegan diet reduced fibromyalgia pain and other symptoms in some participants. These were small, preliminary studies, though, and more research is needed. Regardless if you remove all animal products, greatly increasing your plant food intake can provide health benefits, including reduced inflammation from increased antioxidant intake and better digestion from more fiber. Healthful plant-based diets have also been shown to be preventive in certain diseases like type 2 diabetes, heart disease, and some cancers. This is important for everyone, but people with fibromyalgia will want to especially make sure to drink plenty of water. Dehydration can lead to headaches, fatigue, irritability, and constipation--all things that can make you feel worse. I definitely notice a drop in energy if I haven't been getting enough fluids! Watching your intake of alcohol and caffeinated drinks is helpful as well. If you have anxiety or panic disorder, I would consider reducing or eliminating alcohol and caffeine as both can exacerbate it. I know it's tempting to reach for caffeine when you have low energy, but it can be counterproductive and affect sleep, which is already disrupted in most people with fibromyalgia . Switch to herbal teas, sparkling water infused with fruit or herbs, and mocktails (non-alcoholic cocktails) if you want something other than plain water. There are some amazing sounding infused water recipes here and one of my favorite herbal teas is here to give you a couple of ideas. Have your doctor test for any nutrient deficiencies and supplement if needed. Eat a well-balanced, whole foods, plant based-diet. If you suspect food sensitivities play a role in your symptoms, ask your doctor for a referral to a GI specialist and keep a food and symptom journal to bring to your appointment. Drink plenty of fluids, reduce caffeine and alcohol consumption. If cooking meals from scratch or changing your diet seems daunting to you, start with one small change at a time and go from there. A registered dietitian can provide individualized advice and support. Also, stay tuned for future posts on how to make meal prep easier and other simple changes you can make to feel better. I'd love to hear what has worked for you or one change you'd like to try--please share in the comments! Arranz LI, Canela MA, Rafecas M. Fibromyalgia and nutrition, what do we know? Rheumatol Int 2010;30:1417-1427.